Some friends are obsessed with the celebrity chef du jour. 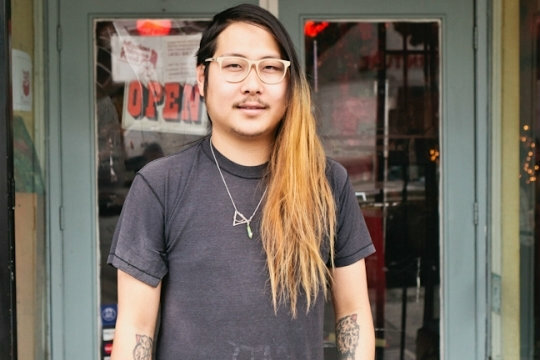 They ask you, “How can I get Danny Bowien’s hair? What about Anthony Bourdain’s humor?” Sadly, those are probably unattainable. But some chef-themed gifts are easy to get… and local. Like sauces from Momofuku, or t-shirts from Crif Dogs. This holiday season, make a wannabe celebrity chef’s dream come true. Why wait on the monster lines at one of David Chang’s restaurants when you can try your hand at making a Momofuku dish at home? Impress your friends with Asian Braising Sauce or Clay Pot Cooking Sauce, both of which pair nicely with meats and tofu. The woman behind Hill Country Barbecue sells bottles of her outrageous hot sauce at a reasonable price. Tell your gift recipient to dunk their meat in this stuff, and to never look back. It’s hard to forget your first bacon-wrapped hot dog from Brian Shebairo and Chris Antista’s dive on St. Marks. Celebrate the decadent late night hot spot with t-shirts sporting Crif Dogs puns or PDT logos. This pricey gift basket has all the Boulud essentials: an autographed copy of “Letters to a Young Child,” Daniel Boulud selection mixed peppercorns, Martin Pouret white wine vinegar, an Epicerie Boulud apron, and more. For the gourmet foodie who can’t get enough of Daniel or DBGB, this will make them feel like a pro.